By the mid 1800s, the Lambeth Parish Burial Ground was not the only London cemetery to be rapidly filling up. In 1850 the situation had become so bad that the idea of a grand metropolitan burial ground serving all of London and its suburbs was being talked about. The London Necropolis & National Mausoleum Company was granted an Act of Parliament in 1852 and bought 2,000 acres of common land in Woking from Lord Onslow. Initially 500 acres of the Brookwood site were set out as a cemetery with two railway stations, the South one for Anglicans, and the North one for Non-conformists. The cemetery, then the largest in the world, was consecrated on 7 November 1854 and opened for business later that month. Private trains run by the London & South Western Railway served the stations. The coffins and mourners, both segregated by class, would join the trains at a private terminus at Waterloo. This was between York Street (now Leake Street) and Westminster Bridge Road. Trains left Waterloo daily running 25 miles down the main line but had to reverse into the cemetery. The original Waterloo terminus lasted about 50 years but was demolished around 1902 when the Waterloo mainline station underwent reconstruction. The replacement Necropolis station was built at 121 Westminster Bridge Road. Around this time the train service was reduced to an ‘on demand’ basis until the 1930s when it was only running about twice a week. The Waterloo terminus suffered major bomb damage during the night of 16 April 1941. The bombs and fires caused by incendiaries effectively demolished most of the station buildings and damaging arches, rolling stock, and sidings. Accordingly the train service was forced to close until after the war when the directors of the company decided that the train service was obsolete. The London terminus and what remained of the rolling stock was sold off. The cemetery’s North station was demolished in the 1960s and the abandoned South station burnt down in 1972. 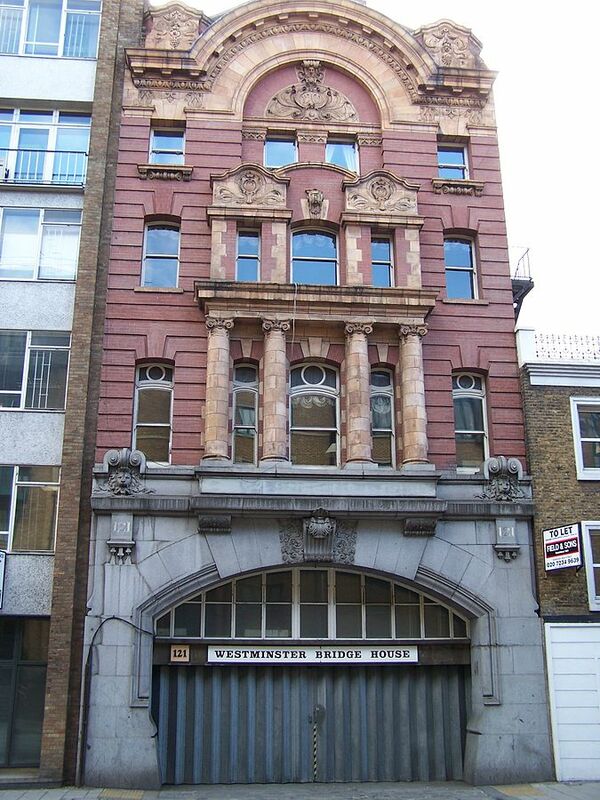 The building and arch for hearses at 121 Westminster Bridge Road are the only outward remains of the London terminus. With grateful thanks to Clive Vaisey for suggesting this topic. From 1703 to 1853 the Lambeth Parish burial ground, on the site of Lambeth High Street Recreation Ground, was land donated by Archbishop Tenison to meet an urgent need for burial space. Lambeth, packed with poor and unhealthy industrial workers, had an average life expectancy of less than 30. The cemetery was enlarged in 1814 but closed in 1853. The site was converted into a public space in 1884 following years of neglect. The gravestones have been resited around the edge of the park.